I hate to break it to you but Margaret Thatcher died this month. Based on Charles Moore’s biography of the former Prime Minister (which was published on Tuesday! ), Young Margaret: Life, Love & Letters includes unique, insightful interviews with some of the people closest to her: including her son, Mark Thatcher. As the title suggests, the ninety-minute-long documentary focuses on Baroness Thatcher’s formative years – specifically those spent at Oxford, when she regularly sent letters to her sister Muriel, whom she was very close to. These letters will be revealed during the programme and offer a rare insight into Thatcher’s softer side as they detail her relationship with Tony Bray, who also features. Recently, we have been bombarded with documentaries about Margaret Thatcher but none seem to have promised such a unique, personal vision as Young Margaret. Also today: Britain’s Got Talent (ITV, 7:00pm) and The Voice UK (BBC1, 8:05pm) both rumble on. In this one-off documentary, Steve Hewlett looks beyond the villainous image we have of News International’s Rupert Murdoch and instead considers how he has changed Britain – and British media – over the past 45 years. Hewlett will delve into how Murdoch managed, in 1968, to double the failing Sun newspaper’s readership within just 100 days, as well as his controversial purchase of The Times in 1981, the launch of Sky TV in 1989 and the infamous phone-hacking scandal of 2011, which changed UK journalism dramatically. Also today: Bill Bailey’s Jungle Hero concludes with a trip to Indonesia (BBC2, 8:00pm); the last in the series of The Secret Millions sees stylist Gok Wan try to turn around more young people’s lives (Channel 4, 8:00pm); Henry McKean investigates The Truth About Travellers (Channel 5, 9:00pm); and Hugh Bonneville and Sheridan Smith co-host The Olivier Awards (ITV, 10:15pm). It has been promoted within an inch of its life – and what I’ve seen doesn’t look much better than Ben Elton’s embarrassing The Wright Way. Then again, Sirs Derek Jacobi and Ian McKellen, Frances De La Tour and the writer of Family Guy and Will & Grace can’t be wrong, can they? Can they? I hope not. Vicious is a very traditional studio sitcom which centres around two aged gay men who have been in a relationship for nearly fifty years. Constantly popping in and interrupting Freddie (McKellen) and Stuart (Jacobi) are their friends: the feisty Violet (De La Tour), the befuddled Penelope (Marcia Warren) and moody Mason (Phillip Voss). A source for one of Freddie and Stuart’s many arguments is their new handsome neighbour, Ash (Misfits’ Iwan Rheon) who looks set to change the dynamics of the couple’s relationship. Yes, filling the gap left by Broadchurch are not one, but two comedies. While Vicious takes up the first 30 minute slot, The Job Lot is covering the remaining half-an-hour. The Job Lot, as you’ve probably gauged from the copious number of trailers, is set in a West Midlands job centre and shows the relationships between the employed (those working in the centre) and the unemployed (those working…nowhere). Russell Tovey (Being Human, Him & Her) and Sarah Hadland (Miranda) are heading the cast as the reluctant Karl and unstable Trish. However, those aren’t the only two big names which The Job Lot boasts – Jo Enright is playing Angela while Benidorm’s Tony Maudsley is the optimistic Graham and Downton Abbey’s Sophie McShera is the deluded Bryony. Also today: Kirsty Young presents another Crimewatch (BBC1, 9:00pm); Irish comedian Dave Allen’s life and career is detailed in Dave Allen: God’s Own Comedian (BBC2, 9:00pm); and go behind the scenes of the home of everyone’s favourite Steak Bake – fly-on-the-wall documentary Greggs: More Than Meats the Pie begins on Sky1 at 9:00pm. Radio 1’s Nick Grimshaw (who wished me luck for my Drama exam on Wednesday – thanks, Grimmy!) 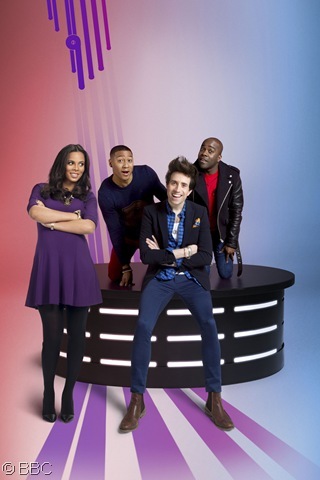 is joined by Kiss FM’s Ricky & Melvin and Rochelle Humes from The Saturdays for this brand-new panel show, which ‘makes a big deal about the little things in life’. So, you can expect to hear about people’s anxieties surrounding stuff such as forgetting someone’s name and the appropriate ways to greet people. It’s all just harmless fun, really – I expect fans of Unzipped or Grimmy’s Breakfast Show would enjoy it. That’s me, then! If you want to join in the conversation about Sweat the Small Stuff, you can tweet @BBCSweat and use #SweatingIt. Phillip Schofield hosts another series of All Star Mr & Mrs, the show which sees celebrity couples being tested on how well they know each other. To kick off the new series, Corrie’s Julie Hesmondhalgh, Dave Myers (one half of the Hairy Bikers) and McFly’s Tom Fletcher are all being quizzed with their partners. Also today: Watchdog is back on BBC1 at 8:00pm; comedian Dara O Briain begins another term at his School of Hard Sums (Dave, 8:00pm); GOLD are bravely airing the first series of Mrs Brown’s Boys at 9:00pm; and hopefully the obnoxious Katie Hopkins won’t have been invited back for the second episode of 10 O’Clock Live (Channel 4, 10:00pm). This two-part documentary series follows the work of Sean James and his team of bailiffs. The no-nonsense Sean is regularly faced with challenging, equally no-nonsense ‘targets’, but is invariably the victor and succeeds in repossessing their belongings on the behalf of finance companies. It is these people who we will meet, along with Sean and his team, across the two episodes. Also today: I lost interest a while ago but if you’re still a fan, Waterloo Road is back on BBC1 at 8:00pm; and Clare Balding guest stars in hit/miss but likeable sketch show Watson & Oliver (BBC2, 10:00pm). Essentially, Would I Lie to You? is little more than a parlour game. A bunch of people sitting round, exchanging anecdotes, the authenticity of which the other players decide on. That’s it. However, it is the quick-witted panellists, armed with hard-to-believe stories which make the show the (British Comedy Award) winner that it is. 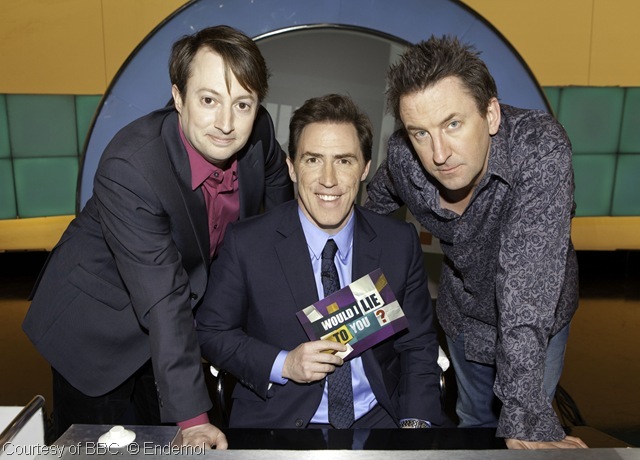 This week, joining host Rob Brydon and brilliant team captains Lee Mack and David Mitchell are Dara O Briain, Rhod Gilbert, Vernon Kay and Denise Van Outen. I just want to take this opportunity to raise awareness for Alex Neal. Alex is seventeen-years-old and a fellow student of mine at Sunderland College. She has a very rare bone tumour, called chondrosarcoma, which is growing around her brain and has already affected her eyesight and hormone levels, meaning she will have to rely on HRT for the rest of her life. This tumour cannot be treated in the UK. Therefore, Alex must travel to Florida to have it treated there. The NHS have agreed to fund her visit – but only with one parent accompanying her. £5,000 is needed to send both of Alex’s parents to Florida with her for this urgent treatment. At the time of writing, an incredible £1,005 has been raised but her family need more and have been campaigning by holding ‘Action 4 Alex’ car boot sales, cake sales and selling wristbands. Any money would be greatly appreciated by Alex’s family. Even spreading the word and encouraging others to get involved would, I’m sure, be greatly appreciated. You can join the ‘Action 4 Alex’ campaign on Facebook or go directly to her auntie’s Go Fund Me page to donate.